– Who are the confidential “Embassy sources” ??? 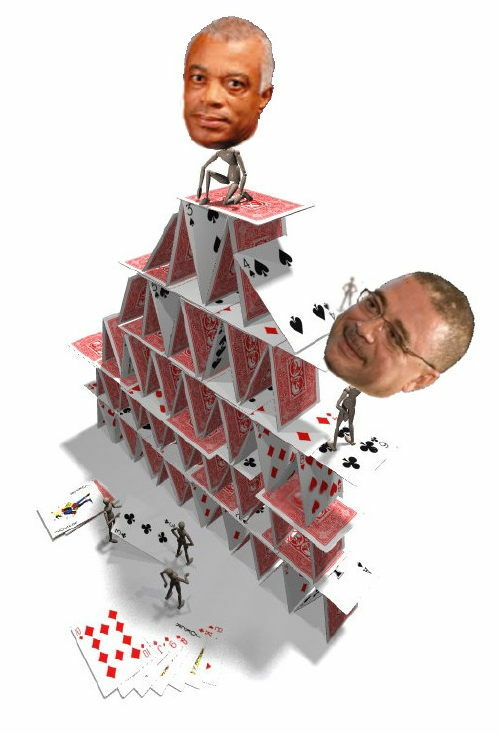 CLICO's lawyer, David Thompson, helped build the house of cards. Thanks to WikiLeaks, Barbadians now know another reason why Prime Minister David Thompson and the DLP Government protected Leroy Parris, refused to place a Judicial Manager for CLICO and did not implement Integrity Legislation. Bajans always knew the whole CLICO-CL Financial / Leroy Parris / David Thompson / DLP connection stank to high heaven, but it is still tremendously saddening to see more evidence that the Thompson/Stuart DLP’s commitment to Integrity and Conflict of Interest laws during 2007 Election Campaign was all a pack of lies. I am saddened. I wanted to believe David Thompson, Freundel Stuart and the DLP. Who the hell do I vote for next time? Mrs. David Thompson declares she’ll speak for St. John in Parliament if voters will have her. Okay, okay – we have to have an election first – but we don’t think we’ll have to eat gull when we predict that Mara Thompson will win the St. John by-election on January 20th and assume the seat formerly occupied by her passed husband, Prime Minister David Thompson. As we said a few days ago when we predicted that Mara would run, we don’t see much of a contest because the Barbados Labour Party is still in turmoil. They can’t even find their computer files and website password so we don’t see how they could possibly expect voters to trust them with another Member of Parliament let alone give them the keys to government again. Owen Arthur thinks he’s the BLP leader but 50% of the party members seem to have some doubts about that. What will Mara’s election change? Nothing really. She’s a bright person – feisty yet classy – but she’s hardly likely to rock the boat which means the by-election will be an amusing distraction that won’t change anything. Same old, same old ’bout hey. As a side issue, the “Queen Maker” DLP adviser Hartley Henry fell ill in the USA over Christmas and has now been released from hospital. Hmmmmm…. we wondered where he was because didn’t see him leaving comments under his usual aliases at BFP or BU for the past week. Good to see him up and around and he says he’ll be back in town for the St. John’s campaign. What would David say to us now, four weeks later? Many folks don’t have that opportunity to prepare themselves and their loved ones – as much as one can prepare. Death is a journey we shall all make, every one of us. Some leave suddenly during an accident or heart attack, maybe even after an argument with an old friend, or cancelling out on visiting father for the third week in a row because of work commitments. If you knew that tomorrow was your time to leave, what would you do differently today? We remember Prime Minister Thompson now, and we will continue to remember him and his widow Mara, their three daughters Misha, Oya and Osa, his mum, Margaret Knight and the rest of David’s family. It’s time for Barbados to get back to work. The Barbados Government Information Service (BGIS) website is our face to the world on the Internet, and if you visit it today you will find that it is representative of our nation’s current upset and malaise over the passing of our Prime Minister. 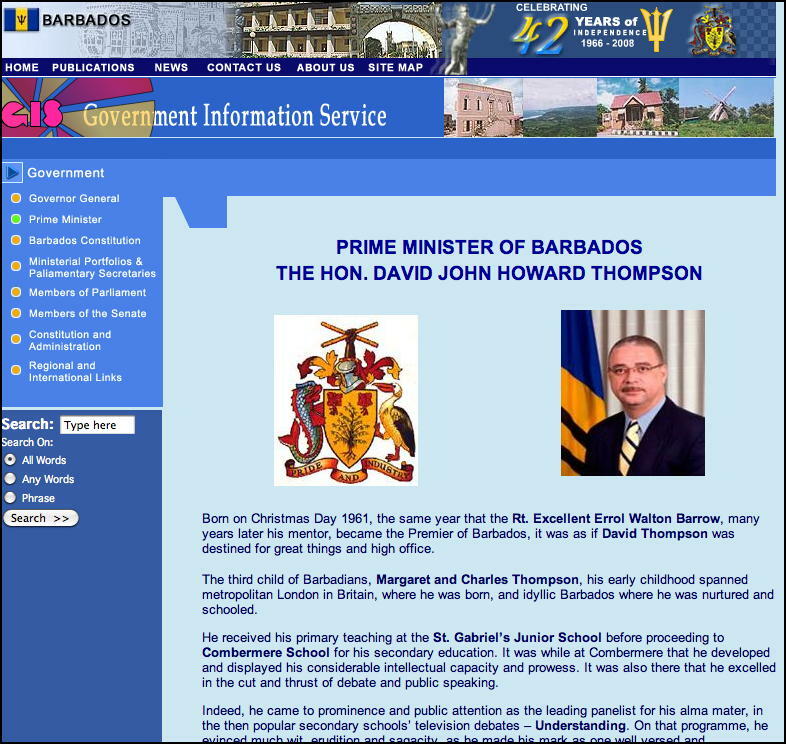 According to the Government of Barbados website, David Thompson is still alive and serving as our Prime Minister. We want our readers to understand that we are not being critical of the folks at the BGIS or their web team. We know that they are working hard to update the many Government websites to reflect our new Prime Minister and the many changes in the government. We’re only using this as an example to say that there are many things that still need to be done as a result of the changes – and while we install the new Captain and crew, we still have to keep the good ship Barbados sailing through the storm. The Lord gave Barbados time to prepare for David’s passing. We mourned and we still mourn, but we must ask ourselves as Independence Day approaches, What would David want us to do now? What would he say to us? Was David Thompson’s cancer related to the stress of his duties? Our friend Jdid wrote this article shortly after the death of Barbados Prime Minister David Thompson. We thought it was a good piece at the time but we just never got around to telling you about it. Ok, is only two days gone and all we bajans still in mourning but I got a certain beef with the whole Bajan Prime Minister David Thompson illness dying thing. Sorry if its not in keeping with the mourning motif but just need to say it anyways. Poll: Should Mara Thompson run for Barbados Parliament? Grenville Phillips II says “Run, Mara, Run!” at his Weighed in the Balance blog. Run to, or run away? Our old friend Grenville Phillips II says that Mara Thompson should run, and that she would make an excellent representative of the people. 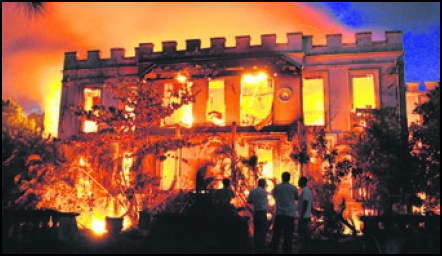 Grenville’s Weighed in the Balance blog has a poll up, so we’ll know within a day or two what Bajans think about this. Click on the poll image or the link to vote.